Q&A is an help-centre to help our customer to solve problem during using,we will update the QA constantly,please contact us if you meet any problem in using. SUPOLOGY mosquito catcher lamp is an ideal power-saving, economical, safe and environmentally friendly insecticidal lamp. Using mosquitoes for sensitivity to specific wavelengths, mosquitoes are attracted by ultraviolet light to trap mosquitoes. ➤【Truely 2018 Newest Version】Maybe you find a lot of bug zappers mosquito trap look the same as ours, but SUPOLOGY Bug Zapper is The Newest Version. We have inproved the ultraviolet LED switch button and lighting modes button, it's more sensitive durable and more high efficiency mosquito killing than the old version. 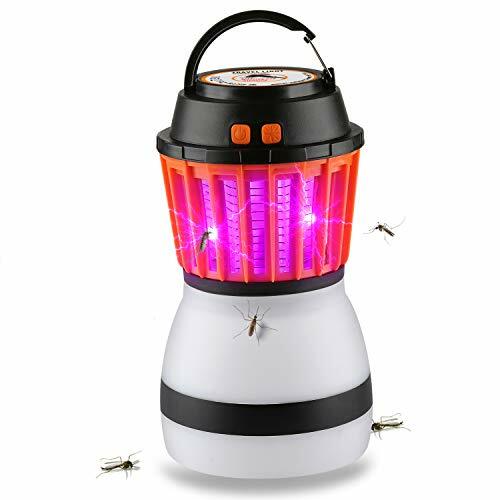 ➤【2-IN-1 Bug Zapper & Lamp】A perfect combination of the mosquito killer lamp, It's not only a ultrasonic insect repellent, it also can be used as a outdoor Light. No chemicals involved in the mosquito zapper, no fumes, no smell, no sprays, no mess, toxic-free and pollution free, which is harmless to your health.100% safe for humans and pets. Safe to use, environmental protection, non-toxic, energy saving, and landscaping. ➤【IP67 Highly Waterproof】The mosquito light bulb has a full-body waterproof function, withstands rain perfectly, when you are outdoor activities, don't need to worry about rainy days. SUPOLOGY Camping Lantern can be washed and soaked directly, there is no impact on the mosquito lights if you accidentally put it into water for it can be soaked in the water in a short time. But remember not to soak the zapper in the water for a long time, or it may cause the damages to the product. ➤【Long Lifespan &Economical】Charging through the USB socket, low temperature and low power consumption. It can work for 12-28 Hours when it full charged. 2-in-1 bug zapper lantern has long service life, and built in 18650 power lithium batteries. Very portable to be put in bag and carried to wherever you go, or hang on a hook or tree with lanyard. Convenient to use in:tent, Courtyard, closet, cabinet, corridor, workshop, basement, garage, stair, roof, camping, hiking, fishing etc. ➤【3 Adjustable Brightness & Deformation Combination】The mosquito zapper lantern has 3 different lighting modes, providing you 3 different brightness levels, High-Mid-Low lights modes with different brightness meets you different demands. 3 modes of operation,bug zapper, light only, bug zapper&light which can be interchangeably switched.